You’d never know that this SUPER thick, rich, and decadent Peanut Butter Mousse recipe is… healthy! It’s sweet, yet sugar free and low carb. It’s delicious, yet dairy free and vegan. It’s addicting, yet high protein and totally guilt free! Would you believe me if I told you that this Peanut Butter Mousse is good for you? Well you should, because it is! It’s all natural, doesn’t have any added sugar, it’s low in carbs, high in protein, high in fiber, and totally nutritious. Don’t worry, though, it doesn’t taste like steamed broccoli or anything. 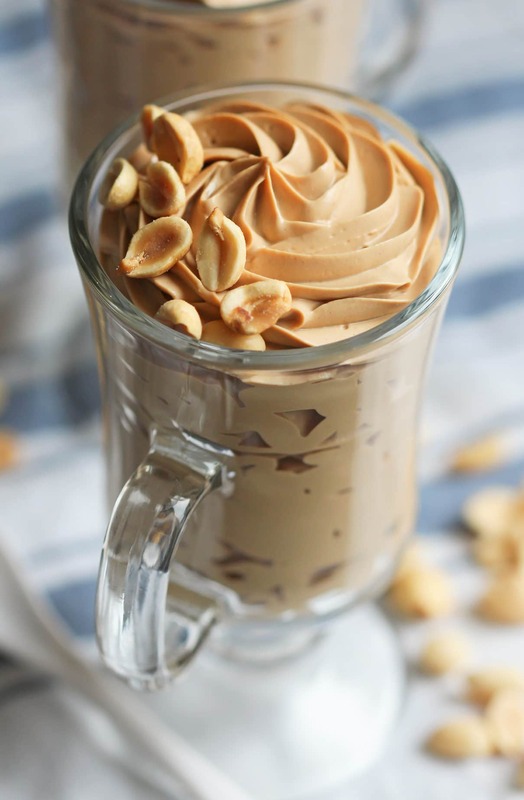 This super easy 5-ingredient Peanut Butter Mousse is ultra rich and creamy, and packed with peanut butter flavor. One little taste you will know what true love is. What I love about this recipe is how quick and easy it is to prepare. I am pretty busy with school right now — lots of classes, lots of homework, lots of exams — so when I’m in the mood for dessert (which is all the time) I need something fast but still delicious. This Healthy Peanut Butter Mousse is IT!! 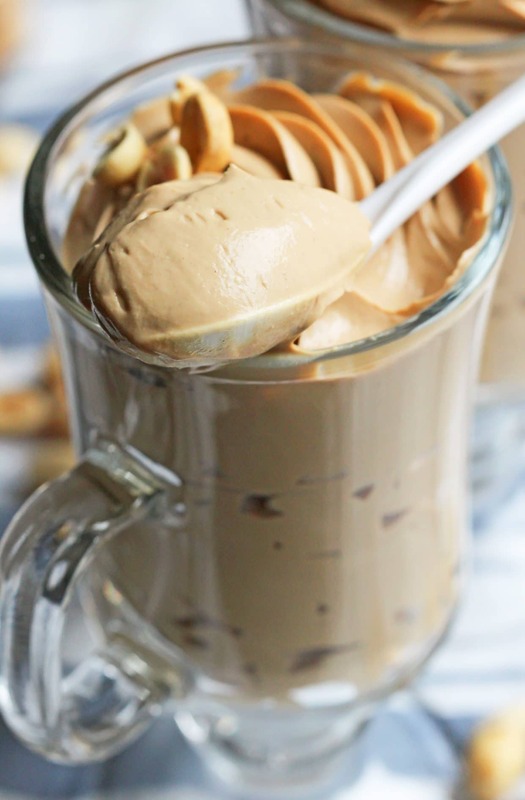 This rich and decadent Healthy Peanut Butter Mousse recipe is secretly guilt free, sugar free, low carb, high protein, gluten free, dairy free, AND vegan! Rinse and drain the block of tofu. Cut it in four pieces and place on paper towels. Press out as much liquid as possible. 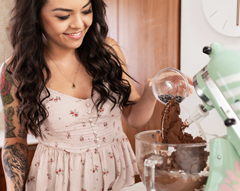 Add all the ingredients to a large blender or food processor and puree until smooth. Scrape down the sides of the bowl when necessary. Give it a taste and add more stevia or salt to taste. Be sure to puree the mixture as much as possible, you don't lose anything by overblending but you sacrifice texture and flavor by underblending! Pour into serving bowls and serve immediately. If not serving right away, cover with plastic wrap and refrigerate. Top the mousse with chopped, salted peanuts and some mini dark chocolate chips if you're feeling extra indulgent! 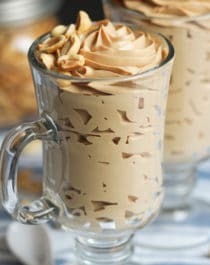 If you want an UBER rich peanut butter mousse, add 1 tsp of Natural Butter Flavor to the recipe! As a comparison, here is the nutrition label for Bon Appetit’s Peanut Butter Mousse recipe. Prepare to be shocked. When I made this mousse for my family, no one believed it was actually sugar free and high protein (let alone vegan). Dad: Wow, it tastes like it’d be really fatty! *scrapes bowl clean* That was really good… Is there any more left? He asked for another bowl later that day. And he had some for breakfast the next day too. Oh, and did I mention that my dad doesn’t even like sweets? So if he likes it, you will too! Those nutritional stats are awesome! No need for those unhealthy 710 cals (!!! 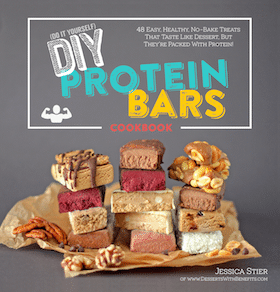 ), and so much more filling yummy protein – sounds like a plan! Looks amazing ! My daughter is allergic to soy any recommendations for substitute ? How well does bananas work with this? I bet a frozen banana would rock with tofu! I have used silken tofu to make some mousse before, definitely have to give this a try too. They look so creamy and smooth! Can’t get stevia extract. What can be use to substitute? Hope you like the PB Mousse!! The body can not absorb that much protein in one sitting. Do not waste those precious protein calories. 20-30g can be absorbed at time. Half the serving for best benefits. 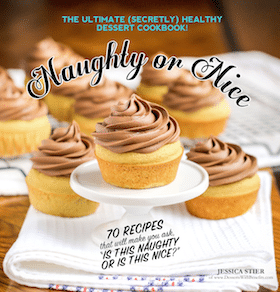 The fat and fiber in the mousse will slow digestion, allowing for better protein absorption. And if this is consumed after a workout, then the body is more receptive to protein absorption as well. And it’s not all about the protein in this dessert, it’s about the overall taste and nutrition — healthy fats, complex carbohydrates, vitamins, minerals, etc. Can I use peanut butter if I don’t have peanut butter powder? If so, how much peanut butter would you use? Trying to get my hands on some peanut flour to make this incredible-looking dessert. Is powdered peanut butter the same thing? 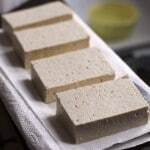 I fully understand the protein pack that tofu has, but what if you can’t use tofu due allergies? What else could be used and still keep things down a bit? Hi 🙂 was wondering if you had any success finding a good substitute?I am also allergic to soy. Did the yogurt/cream cheese work out? Would tofuti work as well as the tofu? This is fantastic. I only had a 12 ounce package of tofu, so I scaled the recipe back. I still made five servings out of it, and it is only 176 calories per serving. I’m having it for lunch with bananas. Thank you! Do you think it would work with almond or hazelnut flour? I’m afraid peanut flour is the key ingredient here. It absorbs a lot of liquid and adds a lot of flavor, while almond flour and hazelnut flour don’t thicken up much. Sorry! Just made this and if was unbelievably filling and rich! Had to add a little extra peanut flour because it was a little thin in my blender. Maybe I didn’t dry out the tofu enough? I didn’t have any paper towel handy so I just drained the liquid from the tofu. That’s a myth. I recommend reading “How Not to Die” by Dr. Gregor. It’s real science, Eat more tofu, everyone! Anyway to make this with peanut butter instead of peanut flour? I haven’t tried that, but I doubt it would work since PB is technically a “liquid” and peanut flour absorbs a lot of liquid, and acts as a thickener here. I suppose you could omit the peanut flour, reduce the almond milk to ~1/2 cup, and add ~2 cups of natural peanut butter? Hope this works! I would really love to know the specific brands of ingredients you used to make this, and what program you ran your recipe through to get your nutrition facts. I love your numbers, they add up to a delightful dessert at a calorie, protein and carb level I would really appreciate, however, I ran these ingredients through myfitnesspal.com, and came up with completely different numbers for 5 servings. I would love to make and eat this, but I cannot justify 337 calories for a 1/2 c serving, and this is 1/3 of my carb “ration” for the day as I am on a weight-loss low carb diet. Do you know if PB2 would work instead of peanut flour? As a staunch meat eater I have never used tofu before but have been adjusting my diet recently so got the ingredients to make a few batches. I was wondering how long this can be stored in the fridge/freezer and whether it affects the product to freeze and defrost? I’m in the same boat! I’m not vegan at all but tofu can be surprisingly versatile, especially in purées and smoothies (trust me, it works)! Because of the almond milk this keeps for ~1 week. I haven’t tried freezing it… if you try it, portion the mousse in individual cups so you can stir it well after thawing it in case the almond milk separates a little. Hope you like the recipe!! Just regular extra firm tofu? not silken? Easy to make. Couldnt find peanut flour so I used almond & coconut flour then threw in some peanut butter. (Would pb protein powder work?) Used my super Ninja! Took a long time to blend to the right texture. Made the result warm so I had to place it in the fridge for a while. Tastes plain. I’m putting chocolate fruit dip I made on it to make it better. I put in a lot more stevia. Like trying new recipes but Not going to try this one again. Cheers for sharing though! Could I substitute avocados instead of tofu? Did you try my Peanut Butter Krispy Treats recipe or are you talking about someone else’s recipe? Mine need to stay refrigerated, and if they are they keep for 1-2 weeks if they’re stored in a tightly sealed container.